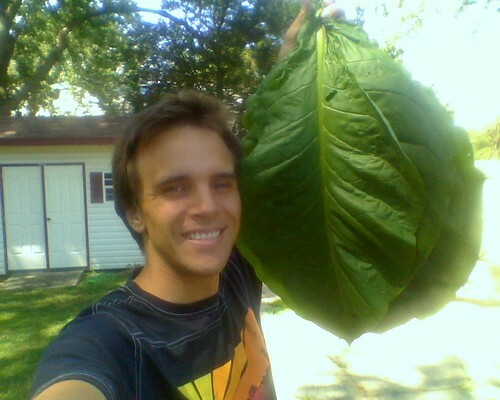 I grew cigar tobacco for the first time last year. 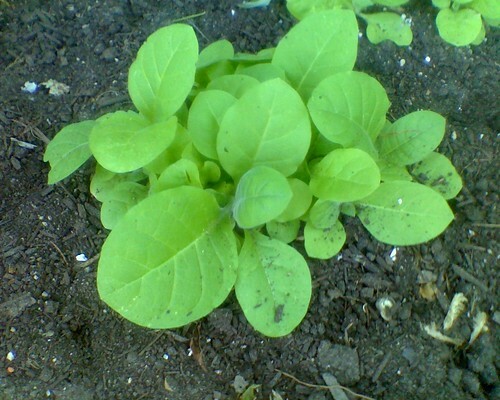 Planting tobacco is weird because the seeds need to lay on top of the soil, instead of being covered or buried. I had more seedlings than I could keep, so I pulled the stragglers out with tweezers. The remaining plants continued to grow until it was time to transplant them outside. I built a 4’x4′ box for the plants to sit in. The plants had cut-off plastic milk jugs on top of them while their roots settled. I used discount wood from Home Depot. The dirt was more expensive. I put too many plants outside as insurance against failure. 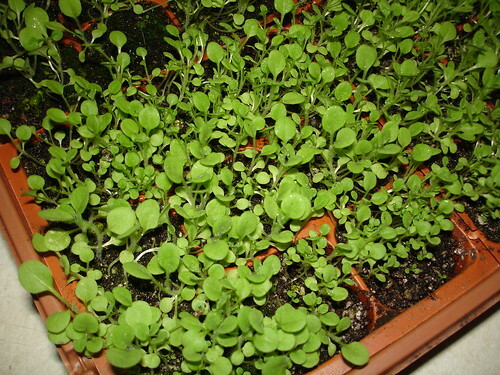 They succeeded, and the smaller plants began to take resources from the stronger ones. I needed to thin out the plants to give the stronger ones room to grow. I had no space to put the smaller plants, and ended up discarding them. I didn’t use any chemicals on the plants. I ran my fingers against the leaves to stop bugs in problematic areas. Squirrels and birds stayed away from the plants. I had five plants total. They started growing really quickly in July. I was torn between two plants during the thinning process, so I filled a bucket with dirt and kept both. The plants were still small in the beginning of August. I worried about the seasons changing. The August heat fixed everything. Little leaves will sprout off at the top of the plant. These “suckers” should be plucked off, since they won’t mature and will only remove energy from the important leaves. A leaf will begin to yellow slightly when it’s ready to be picked. The leaf will snap off if it’s ready to be plucked. 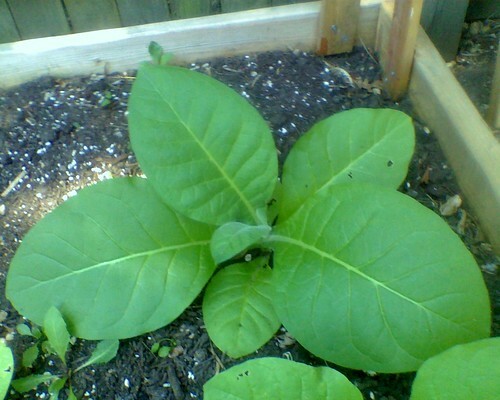 Plucking the small lower leaves is good — the goal is let the large leaves grow as big as possible. The bucket plant began to wilt in August. It stopped wilting in September. The plants were almost completely bare at this point, but lived and continued to produce suckers. I decided to battle them out of the ground in November. I hung the leaves in bundles. They’re still drying now. I’ll roll them into cigars the same way I did when I made them the first time. The leaf is drying in a shed right now. I threw the plants in the shed too (which is known as “whole-stalk harvesting”.) I’m starting this year’s crop now in hopes of getting larger plants. I’m trying cotton this year too, and will post about that in the future. My wife has 12 cotton plants all about 3″ high. Getting ready to transplant in bigger pots then in ground. What will happen in winter in nj? How do I protect them? Great! I’d love to hear how it turns out! 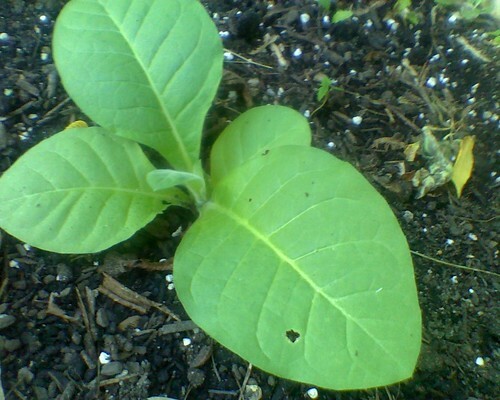 You can get the seeds online, but I wouldn’t be able to help you find actual cigarette tobacco online. If you Google, you should be able to find some though! You know some sheep farmers? Where are they at?! My cat ate my cotton plants, so I can’t give you too much help there! CATS! can I purchase cigarette tobaco on line and can you give me a site ? 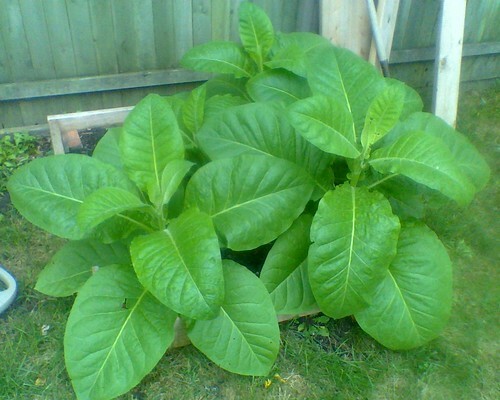 where can I get seeds for cigarette tobaco ? 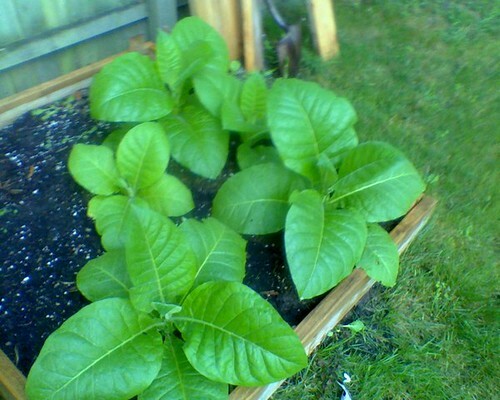 I can’t stand smoking, but I’m curious about growing one’s own tobacco to wean my smoking friends off the tobacco companies. I’m VERY curious about growing cotton; I do spin, knit, and weave my own fibers. I know a few sheep farmers in NJ, but I’d like to make local clothing that’s good for warm weather as well. This is really interesting. Please keep us updated on how the cotton turns out next year. I am in the researching phase now to grow my own cotton. Good Luck! Awesome! Maybe it’s common among programmers or something — very cool :). Actually, my cat ate the cotton! I’ll need to find a safer place to put them next year! LOL one more thing, I also love programming and hacking mobile phones! Strange similarities bro. How did the cotton go btw? I read somehwere that cotton grew amazingly well in NJ during an experiement during the 1800s. Love your posts. 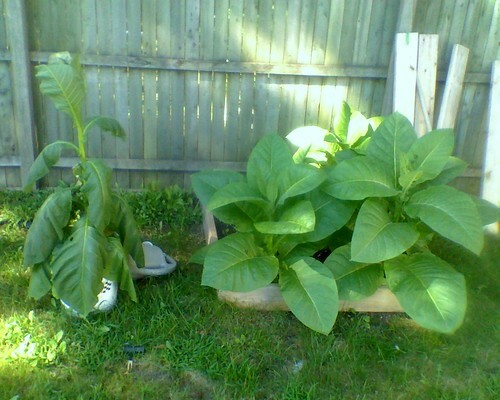 I want to try Tobacco, Ive grown dwarf oranges, lemons, and other fruits. Also grew some Coffee trees (My family owns a coffee importing company.) I live in extreme northern Monmouth county on top of the highest hill in the county / anywhere within 15 miles of the coast from Mainie to Yucatan Mexico, so I have this really cool little microclimate that I have to deal with. Where are you located in NJ? I grew up around people who raised tobacco for a living. I’ve seen my Father take a cured tobacco leaf, roll it up and smoke it. A homemade cigar! Hey to a fellow grower in New Jersey :)! 2) I used half perlite, half moss, kind of out of habit. It’s been great for everything I’ve needed. Once they went outside, I had a mix of manure and top soil. 3) I left them there until I saw a significant amount of leaf growth. You want to make sure the plants take their roots. 4) I always end up overwatering plants, so I actually tried hard to wait to water them. I didn’t have a hard number, I just gave them water when they looked like they needed it. It’s easy to tell when they’re big enough. Know your plants! 5) I didn’t actually use any on them, and I wish I did (I will this year.) I’m not knowledgable enough to be able to give great advice on this yet. 6) I haven’t fermented them yet! 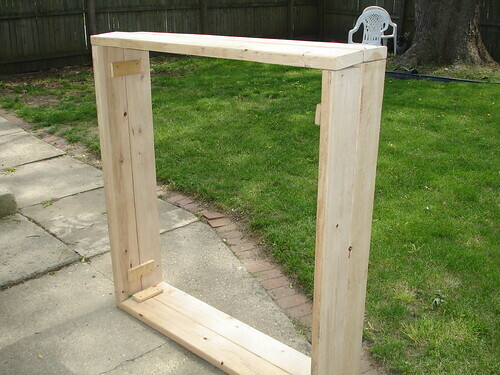 I want to, and I might build a little box to do it. I’ve seen some great stuff on Instructables that use a box and a hot lamp. 7) I pulled them in September. The growing season here is pretty long. Hey Stan, nice work! 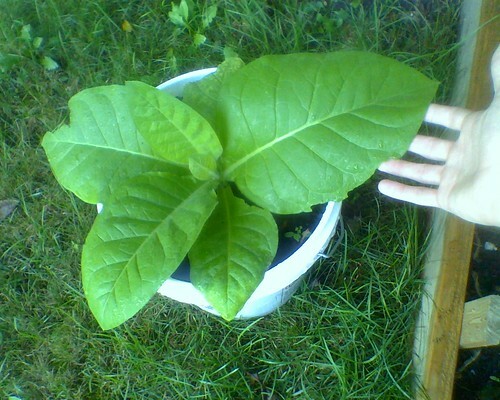 This is my first time growing tobacco (also in NJ). I grew four types: CT Broadleaf, PA Red, and two Havanas. 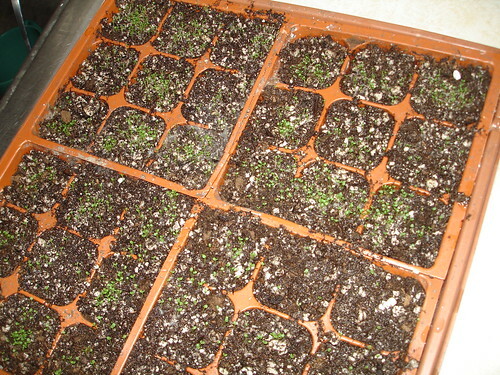 They started to germinate, similar to your first picture (I actually have an exact setup as yours). My question to you: (1) How long did you wait until you transplanted them? (2) what soil makeup did you have in the planter? (3)how long did you leave the milk jugs on top of the plants after you transplanted them? (4) how often did you water them? (5) what fertilizer, if any, did you use (6) did you use a kiln to ferment them? I am thinking about building a kiln to speed up the fermentation process. Finally, when did you harvest your leaves? Thanks alot Stan! Hope to hear back!!! It’s getting to be a little late, but I’d give it a shot anyway. The biggest kicker for me was that I ended up with leaves that dried green. 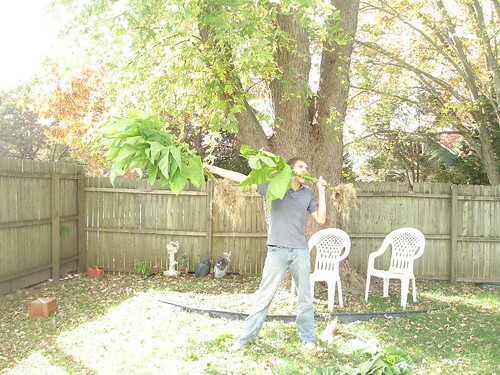 I bet you’ll be able to get the plants large enough, just take extra care when you pull the leaves. Bring them inside so they dry with heat and turn brown. The plants hate being transplanted, so try to keep the change minimal. The cut up milk jugs help the transition from inside plants to outside. By the way, your site looks great! Hilarious, and needed. Hey I just bought some seeds to grow and should plant them next week. Do you think I started too late? Last year I started WAY too late in late June because I had just got the idea and the plants never grew big enough. They all died during transplant. 🙁 Any other advice you can give with planting and transplant too? 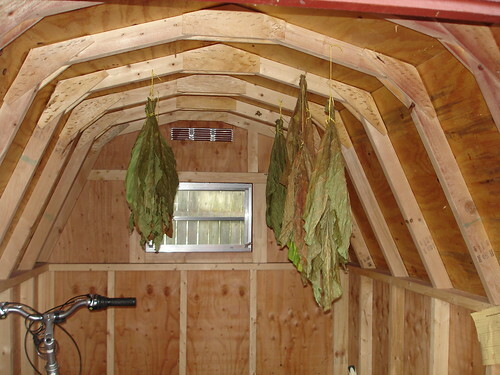 Did you ever make some cigars and smoke the tobacco you grew last year? I’m interested to see how it turned out. There are only a few recipes online, but the gist of it seems like you’d boil apple juice concentrate and mix the leaves in. After letting the whole mess dry for a while, it should be okay to use. I haven’t tried it though. The are also recipes for snus, which involves a lot more salt. I wonder how this can then be turned into chewing tobacco? Does anyone have experience with this? I would like it resemble longcut products. I realize this is probably very hard, but it would be well worth it due to most companies declining to list ingredients. Wow, that’s crazy! It’s fine here as long as it’s not being sold to anyone.